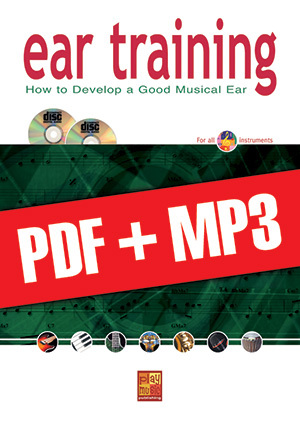 Ear Training - Guitar (pdf + mp3) (GUITAR, Course downloads, Eddie Spencer). Looking for a way to develop your musical ear? By following the instructions given in this coursebook you will soon be able to effortlessly recognize and reproduce the first lick, note, chord, rhythm or solo that comes your way! You wonder how you are going to accomplish this? By studying intervals (from thirds downwards to diminished thirteenths), by identifying chords (from major chords to M7(11#) chords), by recognizing chords and melody played simultaneously, by differentiating between various rhythmic values (between whole notes and eighth-note triplets for instance) or by melody dictations, which are a synthesis of the elements previously studied. Whereas the two CDs supply you with exercises, the coursebook offers you the possibility to write down and check your answers. Since you are dealing here with the downloadable version of the tutorial, the book corresponds to a PDF document and the CDs to mp3 audio files.